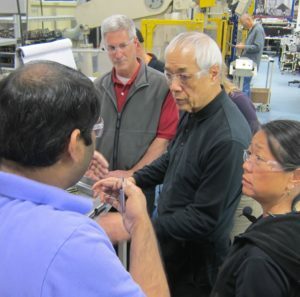 Chihiro Nakao leading genba kaizen at Whitcraft LLC in Connecticut. Photo by Bob Emiliani. Here is your chance to listen to and learn from someone who helped develop, improve, and expand Toyota’s production system! This is a rare opportunity to learn genba kaizen from Chihiro Nakao. Nakao-san has more than 50 years of genba kaizen experience and was a part of the original autonomous study groups initiated by Taiichi Ohno. He also served as Ohno-san’s assistant. Nakao-san is an amazing teacher and an inspiring leader who has spent the last 30 years facilitating genba kaizen world-wide. Don’t miss this chance to learn from Chihiro Nakao. Whether you are the president of the company, HR manager, supervisor, or engineer, you will learn the genba kaizen method by which all other kaizen is compared. We cordially invite you to attend the “2017 Shingijutsu Super Kaizen” to be held Monday, May 1st through Friday, May 5th, 2017 on-site at Whitcraft LLC, a highly successful practitioner of Shingijutsu Kaizen. Arrival will be the afternoon of Sunday, April 30th for a kick-off meeting with cocktails and refreshments at the Hilton Garden Hotel in Glastonbury, Connecticut. Attendees should plan to fly into Hartford’s Bradley Airport (BDL). The $4,000 per person registration fee includes, accommodation for five nights with breakfast and lunch, text books and teaching materials, transportation to and from Whitcraft and a gala dinner. To enhance the individual learning experience and assure maximum results for each participant, we limit attendance to 40. Early registration is therefore desirable. To register please fill in the form and send it to our office in Seattle, Washington. We look forward to seeing you on April 30, 2017 and to sharing our knowledge and experience with you. Submit your application now. I’ll see you there! Disclaimer: I have no financial or other interest in this workshop, and I am not affiliated with Shingijutsu USA. I am simply a friend of Shingijutsu: Bob Emiliani, FOS.